Tag Archives for " Feedly "
Millions use Buffer for it’s core namesake functionality – buffering social media updates over the course of a day. While it does accomplish this task in ways that no other tool has been able to replicate, it does much more. Below are three of my favorite ways to amplify Buffer’s usefulness. One very useful way to use Buffer is in support of a campaign. Let’s say you have an event coming up and you know you’re going to promote landing pages and valuable content related to the event. Or let’s say you have an entire network of contributors, whose content you want to share. Using the 3rd party Bulk Buffer you can add a CSV or text file of dozens or even hundreds of links and have them automatically distributed across your Buffer schedule. I’ve also used this approach to que up an entire week’s worth of activity so I could forget my social habit during a vacation. Of course, you could also do this kind of thing on behalf of a client that has engaged you to beef up their social media participation and sharing. Make sure you install the Buffer Chrome Extension so that with one click you can compose an update to buffer from the page you happen to be on. 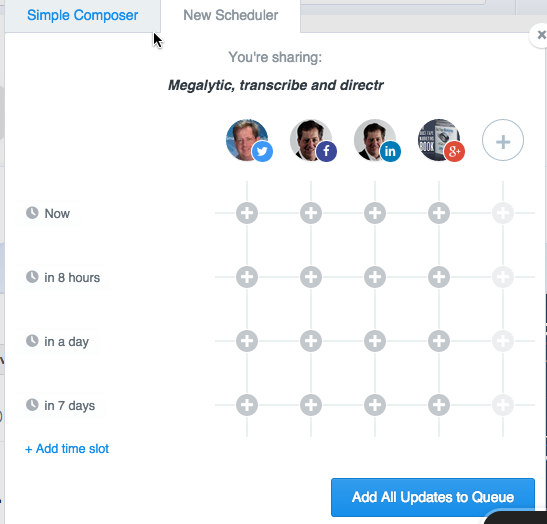 Then check out the “new scheduler” in the window that pops up. This tool allows you to set repeated, future posts of this update in pretty much any schedule you dictate. I will often put blog posts into schedule days and weeks out so that they receive ongoing, future attention without any additional effort on my part. Look, it’s silly to believe that everyone that needs to read your awesome post will see it today. You will find that your traffic for your posts often doubles by adding repromotion to your routine. Even though you can find plenty of people suggesting that no one uses RSS readers anymore, you shouldn’t listen. Subscribing to and easily accessing blogs is still a big part of my ongoing education, sharing and idea getting. Sure, I also subscribe to a handful of targeted aggregators like Newsle and love the “Buffer Suggested” links that show up daily in my Buffer account, but I also fire up Feedly everyday and because I’ve authorized a connection to Buffer I simply share all the posts I want to share during my morning read and push them to Buffer. By adding each of these elements to my daily and weekly routine I can multiply my social media sharing efforts with very little extra work. What are your favorite Buffer hacks? 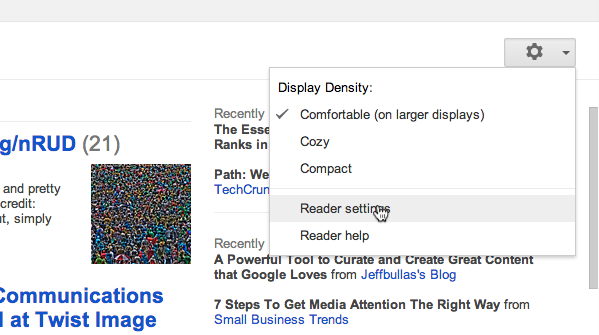 8	Are You Prepared for the Google Reader Shutdown? As has been widely reported, Google Reader is shutting down July 1, 2013. Now, in typical Google fashion, no one really knows what will actually happen on the that date, but as I it see you have about three choices if you are to continue to consistently consume blog content. There are actually many options for moving your existing RSS subscriptions to another setup that can pretty much make the change a non event and may even turn up some enhancements. 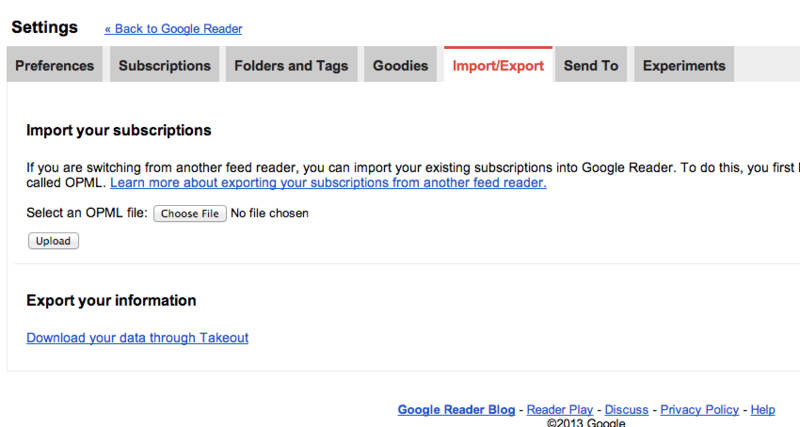 The first step is to export your current subscriptions out of Google Reader so that you have a file you can import to other services. A number of other RSS readers have built this feature in and can do it automatically once you grant access. Here’s how to export your data from Google Reader as an OPML file. 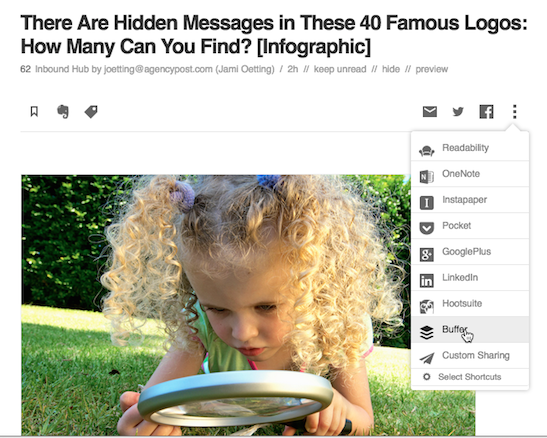 Feedly, another popular alternative, combines bookmarking with feed reading and sharing. 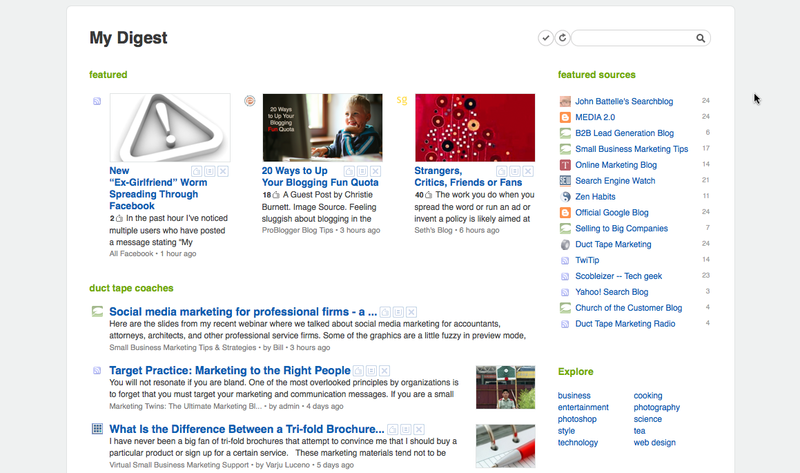 NewsBlur is a simple interface that includes mobile apps and ability to share stories your find on popular sites such as Evernote. The ReederApp allows me to do lots of things with individual blog posts such as submit to Buffer, add to Delicious, Tweet or email directly from within my phone – I depend on this function as I share a lot of content in social media and this makes it very easy to do so. Another approach is to forget your past subscriptions and simply sign up for an RSS reader you fancy and start subscribing to blogs based on where you are today. I’ll admit, even with constant housekeeping there are some blogs in my reader that I don’t give much love. If this sounds appealing you can skip the export (although you may want to do it anyway just in case) and simply pick a new reader and start subscribing. An entirely different option is to think otherwise about the content altogether. Instead of subscribing to any particular blogs you could subscribe to topics or rely on trusted friends to tell you what they are reading. This can be a great way to stay laser focused on just the stuff that interests you and start building some “reading networks” in favor of reading destinations. One service in particular that I think excels in this area is Newsle. Newlse allows you to follow the reading activity of people in your social networks. It will identify influential people and what it calls famous people, but essentially you can follow anyone you want and create alerts. One might consider, for example, creating a list of major clients or important journalists and keeping tabs on what they are writing and tagging. Frankly, I’m doing both – continuing to read RSS feeds and following curated lists on Newsle. If you use an RSS reader to subscribe to and read blogs (and you should) then you know what a great tool it can be to keep you up to date, well-read and inspired. 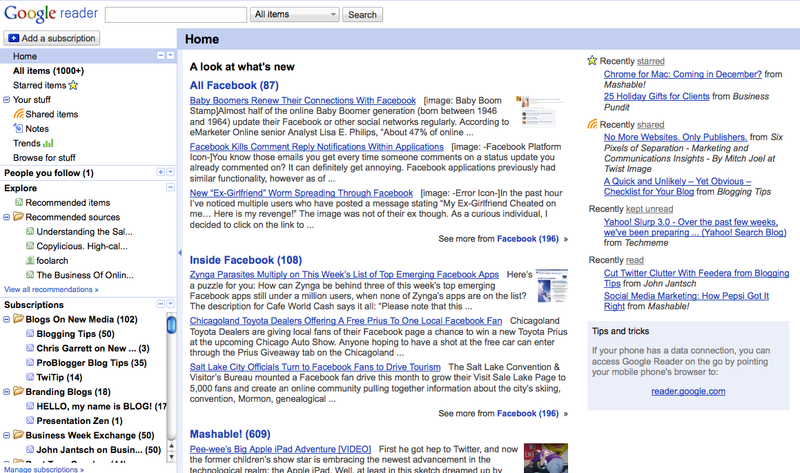 I’ve used the free Google Reader tool for a long time and love it’s simplicity. However, a reader of this blog (Rob Kirby) pointed out a very cool tool called Feedly that takes my subscriptions and creates a much better looking magazine like interface. To me better looking translates into more useful when it comes to scanning a hundred blogs or so. Feedly immediately brought all of my feeds and organization folders over from Google so set-up was instantaneous. But that’s just the beginning. Feedly is a Firefox add-on that functions using my Google Reader account so all my Feedly activity is still saved to Google Reader. Adding blog subscriptions as simple as a click, but I can also pages I find, video, images, anything I want to bookmark and organize. I can share and email articles I find and the tool analyzes the content I seem to like and gently suggests where I might find more.